"Gaeth hi ei geni yng Nghymru." Translation:She was born in Wales. Can anyone explain all the extra letters in "yng Nghymru?" When "yn" means "in" it causes a nasal mutation. T, C, P, D, G and B are all the letters that mutate nasally. 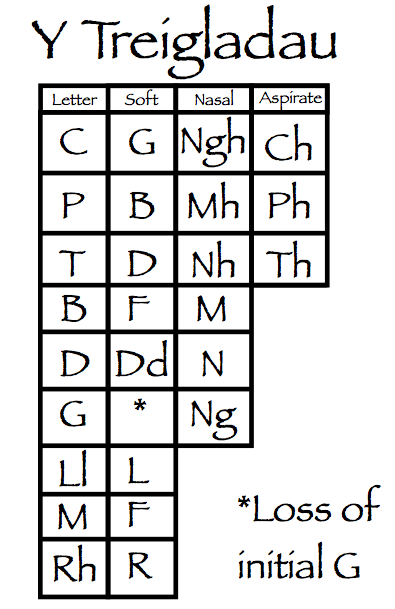 (https://31.media.tumblr.com/tumblr_m9ox8wy0rR1rw84ef.png) This is a link to a mutations grid which shows you how all the letters mutate. Cymru starts with a C and therefore it becomes "Ngh" when it mutates nasally. When "yn" precedes a word that begins with "ng" it becomes "yng" to make it easier to say (the same happens for when "yn" comes before an "m" in which case it becomes "ym"). So to put the phrase together "yn" + "Cymru"= "Yng Nghymru" (Note that the "ng" is pronounced like the English "ng" just that the "g" isn't re-pronounced and the "h" is always said fully i.e never left out). Great explanation. Thanks very much!